"I resolved to have a thoroughly good sailing boat -- the largest that could be well managed in rough weather by one strong man, and with every bolt, cleave, sheave, and rope well-considered in relation to the questions: How will this work in a squall? On a rock? In the dark? Or in a rushing tide? A crowded lock? Not to say in a storm? She was to be first safe, next comfortable, and then fast." While we were docked in Sturgeon Bay, Wisconsin this past summer, we ran across a very interesting cruising sailboat. At first glance you may say that Falcon II is simply large, but then question what makes her so interesting? And to that I would volley back with several responses. First, Falcon II is an aluminum hull from one of today's superyacht builders, Palmer Johnson. Next I might mention her trio of helm seats, complete with wedge-shaped cushions that can be adjusted to compensate for either a port or starboard heel. But what I find most interesting about Falcon II is her boom-less rig. 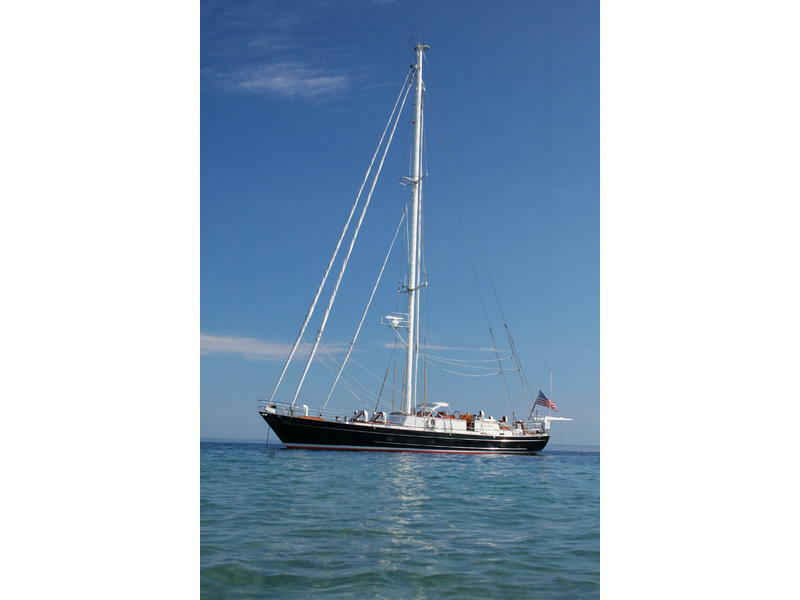 That's right, this 62-footer features a mainsail without a boom. She was designed this way to keep things simple and safe for a short-handed crew. Her accommodations below deck are also designed with a small crew in mind, perfect for a couple with three kids! But alas, even though she's currently on the market, Falcon II will escape our loving ownership because of a price tag that dwarfs my mortgage. Oh well, at least it was free to check her out on the dock. Now those are comfy helm seats! All lines led to the helm...in a very organized manner.